Reserve JR-WEST RAIL PASS from this website. 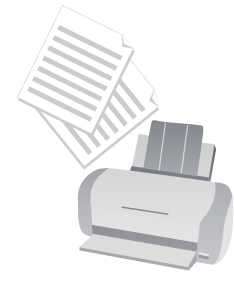 Print out a copy of your booking confirmation e-mail. Go to JR-WEST Ticket Office at the JR-WEST station you specified when you made your reservation, and pay for and collect your rail pass. ･ You can reserve Sanyo-San'in Area Pass which will start to be used between 2 and 27 days from the date the reservation is made. ･ Reservations for accompanying reserved seat tickets can be made for trains boarded between 2 and 27 days from the date the reservation is made. * Sanyo-San'in Area Pass cannot be used on Bullet Train "TOKAIDO SHINKANSEN" (between Tokyo and Shin-Osaka). ･ Between 2 and 27 days from the date the reservation is made. 1.Click either "Book Now!" and proceed to the Agreement screen. 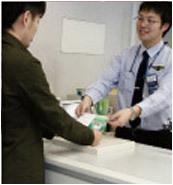 3.In "Booking application form," fill out the compulsory fields (First name, Last name, Passport number, Nationality, E-mail address, Date of birth, Passengers [Adults/Children], Date your rail pass will be used from, Station where you will pick up your rail pass, Duration of your rail pass, [Sanyo-San’in Area Pass only] Information about reserved trains), click the "Confirm" button and proceed to the Confirmation screen. * To make seat reservations, look up train numbers for Bullet Train "SANYO SHINKANSEN" (between Shin-Osaka and Hakata), Kansai-airport Express HARUKA (between Kyoto and Kansai-airport) by using the Timetable & Fare Finder. 4.In The Confirmation screen, check that all details are correct, and click the "Submit" button to apply for your booking. An e-mail indicating that your booking application has been received will immediately be sent to the e-mail address you supplied. * If you enter your e-mail address incorrectly, we will not be able to contact you. Notice : If you can not receive the "Booking confirmation e-mail". 5.Within 24 hours after receiving your booking application, you will be sent "Booking confirmation e-mail" containing booking details and your Reservation number. Your reservation will be complete at the time you receive "Booking confirmation e-mail". * If you cannot make a seat reservation for your preferred train or if a reservation has been made for the earlier or later train because all seat are full, all information will be in "Booking confirmation e-mail", so please check it carefully. 6.Print out "Booking confirmation e-mail" containing your Reservation number and take it to the designated station when you pick up your rail pass. * It is possible to pick up your rail pass by writing down your Reservation number on a piece of paper instead of printing out of "Booking confirmation e-mail", but as it will take longer to process, we recommend you to bring a printout of the e-mail. * Up to 6 train reservations can be made with this service (limited to journeys made by all group members). Please make any further train reservations at JR-WEST stations. Reservations can only be made for Bullet Train "SANYO SHINKANSEN" and Kansai-airport Express HARUKA. Visit the JR-WEST Ticket Office in any station for more information. * With this service, all seats available for reservations are non-smoking. * If you reserve a seat on Kansai-airport Express HARUKA after entering in Japan through Kansai International Airport, please be aware that it takes 1 hour on average from your flight's arrival time until immigration procedures are completed. In addition, you will need to pick up your rail pass at least 30 minutes prior to Kansai-airport Express HARUKA's departure time (Picking-up dead line). * Changing from Kansai-airport Express HARUKA to Bullet Train "SANYO SHINKANSEN" in Shin-Osaka Station requires at least 10 minutes. * As an action to take if there are no reserved seats available on your preferred train, select either "Book reserved seat on earlier train", "Book reserved seat on later train", or "Do not book seats on earlier or later train." You will still be able to use non-reserved seats even when you do not book reserved seats. Selecting the earlier/later train option will search for another train up to 1 hour earlier/later than your original desired train. And then, you will pay by cash or credit card for your rail pass. * Regarding (2), if there is more than one person who will receive rail passes, you will need to show all passports. * It is possible to pick up your rail pass by writing down your Reservation number on a piece of paper instead of printing out of Booking confirmation "e-mail", but as it will take longer to process, we recommend you to bring a printout of the e-mail. Please pick up your rail pass at the station designated when applying for your booking. Please view the attached station map to find the location of JR-WEST Ticket Office. 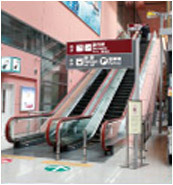 Go out the arrival exit on the first floor of the Kansai International airport. Proceed to the second floor. 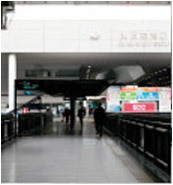 Look for the corridor to the JR Kansai-airport train station. 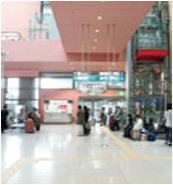 The JR Kansai-airport train station is located at the end of the corridor. 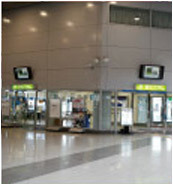 Look for the JR-WEST Ticket Office (indicated by a green sign) located at the far end of the station. 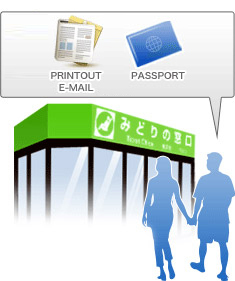 At the JR-WEST Ticket Office (indicated by a green sign), please show your passport and a print out of your reservation confirmation mail. Fill out an application form. In exchange, you will receive a JR-WEST RAIL PASS. * Please be aware that you cannot pick up your rail pass without Reservation number. * After Picking-up deadline expires your booking will be cancelled automatically. * For seat reservations for which you applied with this service, please ask for them at a station. Inquiries regarding this service can only be received via "Inquiry form" at this website. * We regret that we are unable to respond to any inquiries regarding services other than this service. 1.Fill out the compulsory items (First name, Last name, Nationality, E-mail address), type your inquiry in the relevant field, and then click the "Confirm" button to be taken to the Confirmation screen. 2.On the Confirmation screen, check that all the details are correct, and click the "Submit" button to submit your inquiry. An e-mail confirming that your inquiry has been received will immediately be sent to the e-mail address you supplied. 3.You will receive an e-mail reply to your inquiry within 24 hours of the time your inquiry was received. * Depending on the content, some inquiries may take longer than others. 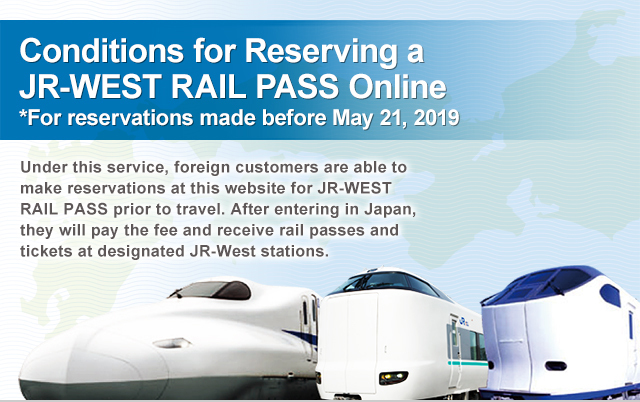 To change reservations for JR-WEST RAIL PASSES (including ICOCA and HARUKA) other than the Sanyo-San'in Area Pass, use the "Cancellation form" to cancel the reservation, and make a new reservation using the "Booking application form" at least 2 days in advance. Change of your booking can be received via "Sanyo-San'in Area Pass Changing Reservation form" at this website. 1.Fill out the compulsory items (First name, Last name, Nationality, E-mail address, Reservation number, and Date of birth), type your booking change order in the relevant field, and then click the "Confirm" button to be taken to the Confirmation screen. 2.On the Confirmation screen, check that all the details are correct, and click the "Submit" button to submit your order. An e-mail confirming that your order has been received will immediately be sent to the e-mail address you supplied. 3.You will receive two e-mails (one is our reply to your order, and another is the new booking confirmation containing new booking details and reservation number) within 24 hours of the time your order was received. Cancellation of a booking can only be received via "Cancellation form" at this website. 1.Fill out the compulsory items (First name, Last name, Date of birth, Passport Number, E-mail address, and Reservation number) in Cancellation form, and click the "Confirm" button to go to the Confirmation screen. 2.In the Confirmation screen, check that all the details are correct, and click the "Submit" button to cancel your booking. An e-mail indicating that your cancellation request has been confirmed will immediately be sent to the e-mail address you supplied. * We will post online and elsewhere times that the service is temporarily down for maintenance.